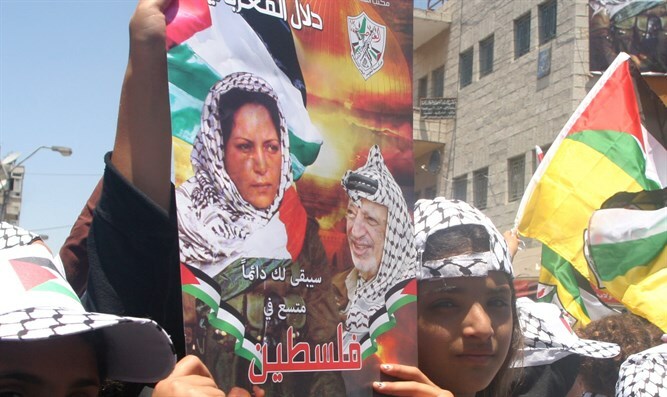 Mahmoud Abbas' Fatah faction names summer camp after Dalal Mughrabi, who led terror attack which killed 37 civilians. A summer camp run by Palestinian Authority Chairman Mahmoud Abbas’ Fatah faction has been named for one of the most notorious terrorists of the past half-century, a mass-murdererss responsible for a terror attack which left 37 Israelis dead and more than 70 wounded. This summer, Fatah opened the “Martyr Dalal Mughrabi Camp”, named after the Fatah terrorist who helped organize and led the 1978 Coastal Road Massacre in which 12 Israeli children and 25 adults were slaughtered. "The [PA] Ministry of Culture office in the Salfit district visited the summer camps in Yasuf, with some of the most prominent of them being the Martyr Dalal Mughrabi Camp under the supervision of the Fatah Movement and the Yasuf Youth Club, and the Childhood Ambassadors Camp funded by the World Vision organization and the Yasuf Village Council,” Al-Hayat Al-Jadida reported. “Deputy Director of the Ministry of Culture office in Salfit Issam Abdallah spoke about the importance of the summer camps, and the interest they are revealing among the participants in the fields of art and creativity. He added that the Ministry of Culture is showing great interest in camps like these and met with the creators and the talented [participants, who focus on strengthening the importance of the Palestinian heritage in the minds of our children. Their heritage is one of the most important symbols of Palestinian identity and culture." Earlier this year, Palestinian Media Watch revealed that funds provided by the United Nations and Norway had been used to support a women’s center named after Mughrabi in the town of Burqa. Norwegian Foreign Minister Brende demanded the PA immediately return the donated money and remove the Norwegian Foreign Ministry logo from the building.